When we read or hear that electrifying speech from Washington, it seems that 1963 was ages ago. But you just need to see our current reality and juxtapose those words to realize that the struggle for equality and freedom in the United States is far from over. "I dream that one day this nation will rise and live the true meaning of its creed," said King. "We hold these truths to be self-evident: that all men are created equal." That equality - emblem of universal human rights - is undermined by divisionist, racist, classist and isolationist policies that come out of the White House in tweets, statements and judicial decisions that put the white man in front of their immigrant fellow citizens. The associate professor at Bentley University, Donna Maria Blancero, said in a column: "If Dr. King were alive today, he likely would be working side by side with Latinos to address issues of inequality." And that would be more than likely, as the pastor shared this battlefront during his crusade for Civil Rights. Adriana Cataño remembers how King was aware that the conditions covered other minorities and tried to summon the Hispanic masses for his demonstration. In her column for Remezcla, Cataño exposes how the pastor asked Gilberto Gerena Valentín (the then president of the Puerto Rican Day Parade) to urge other Latinos to take the streets. 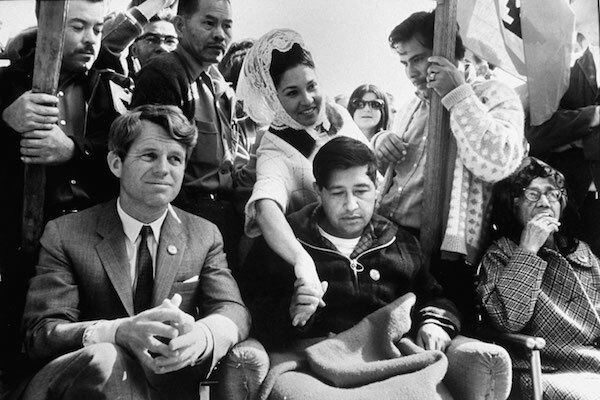 Likewise, the pastor was an open supporter of the struggle of César Chávez, who during his hunger strikes received several telegrams from King. On the other hand, between 1962 and 1965, Martin Luther King visited Puerto Rico three times, visiting universities and speaking in front of student groups to reject the criminality arguments that stigmatized the community of color during the time. "They fail to see that poverty and ignorance, these breed crime whatever the racial group may be," he said in his speech. For his part Raul Yzaguirre, former president of the National Council of La Raza, said in an interview with Associated Press that, "Although the focus was on the African-American community at that time, I think his thoughts, his sense of justice resonated with those of us who had perhaps a broader sense of inclusion, who wanted Latinos and Native Americans and other minorities to be an integral part of a civil rights movement." Although Latinos were few during that massive concentration in Washington on August 28, 1963, the demonstration of strength and conviction of those who fought for equal conditions was the definitive inspiration for what would follow later. We should think back to the amount of ads in Texas that read "No dogs, no negros, no Mexicans" and realize that the situation was the same for everyone, not far from what we’re living today, when we continue talking about obstacles for professional achievement, the evident inequalities in the socioeconomic status of the populations of color and the open and resounding discrimination suffered by so many Latin Americans in the United States under the "America First" slogan. But let's avoid reductionisms; this is not new. In November 2013, religious leaders and activists joined the campaign of prayer and fasting ("Fast4Families") in Washington, DC, to demand an immigration reform, according to El Tiempo Latino. At that time, activist Eliseo Medina declared to the media: "Like the civil rights movement that the Reverend Martin Luther King Jr. initiated, and the one led by César Chávez, Fast4Families calls for a change in morals for immigration reform. It's not about politics but about doing the right thing." Today, five years later, politics is ten times more radical, and "doing the right thing" depends on each person's perspective. 55 years ago the struggle was "for jobs and freedom". Today, hundreds of thousands of Latinos have been left without Temporary Protection, have been cornered and deported, and hundreds of others live day by day the anguish of not knowing if tomorrow they will have the right to work because the president intends to negotiate their dreams with a border wall with Mexico. How much has changed and how much have we learned? The struggle remains urgent, today more than ever.